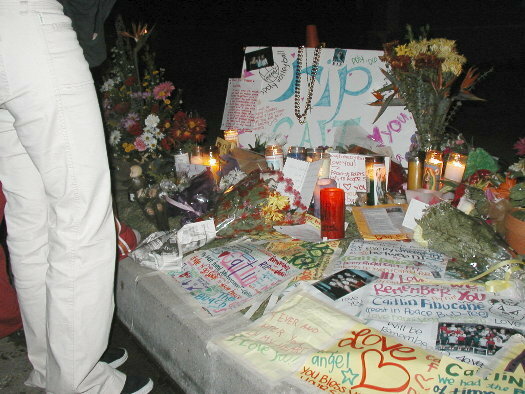 (November 29, 2004, updated Nov. 30 w/ memorial service information) -- In a spontaneous outpouring of affection, a neighborhood shrine has risen near the corner of Orange Ave. and 37th St. where a November 27 traffic accident took the life of 16 year-old Caitlin Finucane. A wintry wind didn't deter a steady stream of visitors, which extended well into the evening on November 29, some leaving flowers, others lighting candles and still others bringing posters and writing messages in her memory. "It wasn't your time to go. You will be will be in our hearts and prayers," said one of many messages. Teens and adults expressed heartfelt emotions. Among them were classmates from LB Polytechnic High School where Ms. Finucane was a student, as well as former classmates from Wilson High where she was previously enrolled. 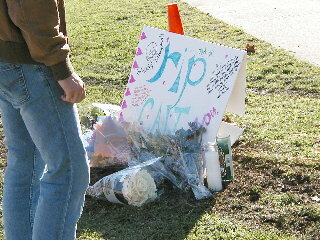 "Caitlin was a truly wonderful person," a Poly High student told us, her voice breaking. 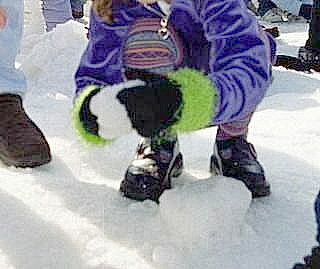 Another, speaking of Caitlin in the present tense, said "she is a kind and caring soul. I've never met anyone who's a more genuine person than she is." 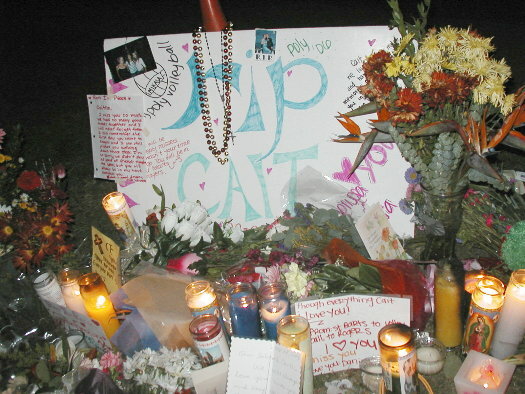 Poly High students described a subdued mood on campus, where adult and peer counselors spoke with students and a large picture of Caitlin was posted with yellow and pink flowers, her favorite colors. Two Wilson High students came to the shrine wearing red ribbons with Caitlin's name. They said a number of their classmates wore similar ribbons all day at school. 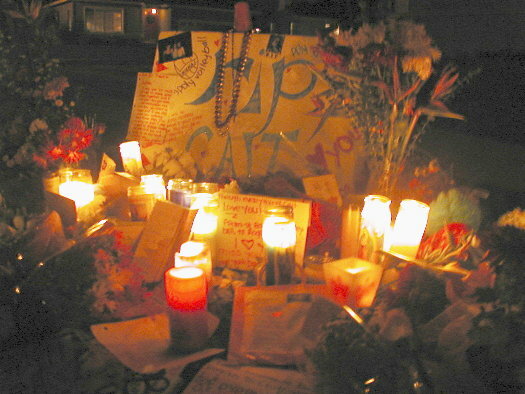 The neighborhood shrine appeared within hours of Caitlin's passing, launched in part by a Poly High classmate who brought one of many posters. [update] Service and memorial will be Saturday, Dec. 4th, 12:00 p.m. at All Saints Church, 346 Termino Ave., Long Beach. 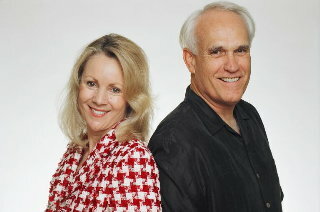 In lieu of flowers, donations to Miller's Childrens' Hospital, 2801 Atlantic Ave., Long Beach.